Vampire Academy Community - Win Prize Packs! 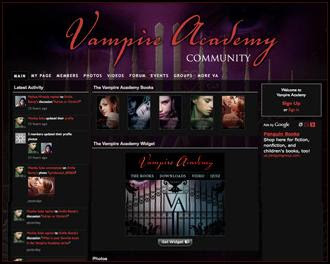 On Penguin Book's Official Book Website for Vampire Academy they've added another feature recently: A Vampire Academy Community on Ning! There you can create your own account and add different apps to it, connect with other fans and discuss the books. They're also having a contest where they are giving away giving away 10 Vampire Academy prize packs in honor of the release for Spirit Bound! The prize packs include a Spirit Bound Poster signed by Richelle Mead, a Vampire Academy t-shirt and Vampire Academy tattoos! All you have to do to have the chance to win, is to add a comment to their contest post. Click here to get to the post. Unfortunately, I don't know if the contest is open internationally.